Excellent for professional grooming tools and equipment; cleans and disinfects. 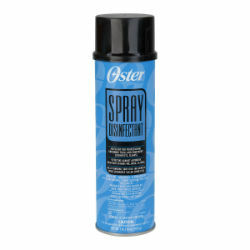 Oster® Spray Disinfectant deodorizes surfaces and kills most Staph and Strep organisms, pseudomanas aeruginosa and athletes foot fungus. Germicidal, Fungicidal, Staphylocidal, Pseudomonacidal, Tuberculocidal, Virucidal. Kills most germs and bacteria, eliminates odors, and prevents mold and mildew. Clean scent For use in hospitals, salons, and households.